Today, in addition to operating a flagship facility in Colville, Washington, Vaagen Brothers Lumber operates a sawmill in Usk, Washington, Midway, BC and with the recent addition of a planer mill in Athol, ID. 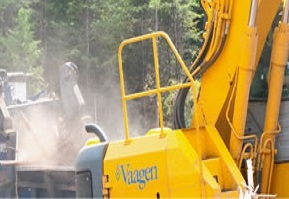 Vaagen is expanding their forward thinking practice of optimal resource management. At each Vaagen operation, quality lumber begins with quality trees. High-quality small trees yield good small logs, starting at 4 and a half inches on the small end and 14 inches on the large end. Species range from Dougless Fir, Larch, Pine, and Hem Fir. Log supply comes from private, state, federal, and tribal land. Once logs arrive at the Colville operation, they are weighed and unloaded by the companies 128 foot P and H crane. 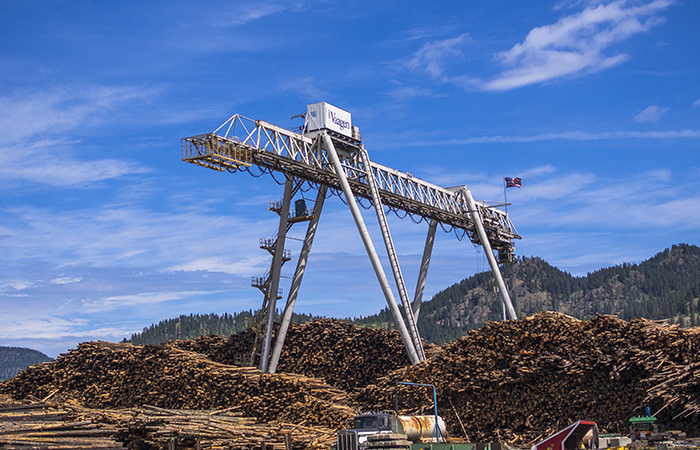 Towering above the mill, the crane feeds logs into all machine centers and handles 500 bites of material per day.